Hearty, nutritious, and delicious, this butternut squash soup is a favorite request from a woman I cook for about every six weeks. Each visit I make a double batch and freeze it in small individual containers. This soup freezes and reheats very nicely, and it is always on her list of meals for me to create. Because butternut squash is tough to cut and peel, I either bake it whole or cut it in half vertically. For a medium size squash (around 1 ¼ lbs. ), baked whole, wash the squash and prick holes with a fork all around the outside to prevent the squash from exploding in the oven. Set the oven to 425 degrees F and bake for 1 hour and 15 minutes. If choosing to bake in halves, wash the squash, cut in half vertically, remove the seeds and lightly coat the flesh with olive oil and season with salt and pepper. Bake at the same 425 degrees F. Baking takes about 45 minutes to one hour, and I bake the two halves cut side up. Baking is done on a cookie sheet for both methods. Microwaving butternut squash can greatly reduce the cooking time. I prefer the taste of my butternut squash baked in the oven, but that may not make a difference to most people. If microwaving whole, wash the squash well and prick several holes all around. Set in a shallow microwave baking dish and cook on high for 5 minutes. Turn over and cook on high for another 5 minutes. Test to see if a knife slides easily into the center of the squash. If not cook for another 3-5 minutes on high until done. Or, cook whole for 5 minutes, and then cut vertically in half and cook another 5 minutes cut side up. Once your squash is cooked, let rest before peeling. This makes the peeling process a lot easier and faster. 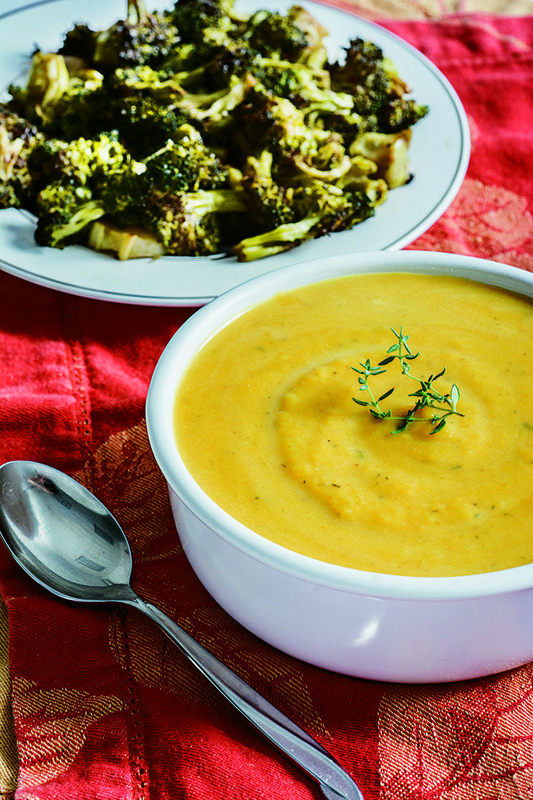 This soup has a rich butternut squash flavor – perfect for a chilly fall/winter day. NOTE: Once the squash is finished, I roast a pan of vegetables, such as green beans or broccoli, to have as a side dish. Butternut Squash Soup - Serves 6 or freeze in small individual containers (about 12-16 small containers). Cook squash either in the microwave or oven. In the meantime, chop the carrots, onion, and garlic. Heat 1 Tbsp of olive oil in a large pot on medium heat, and add the carrots, onion, garlic, thyme, and parsley. Cook, stirring occasionally to make sure the garlic does not burn. Cook until the onions are soft, about 7 minutes. Add the chicken broth and the cooked butternut squash and simmer on medium/low for about 10 minutes. Use a blender, immersion blender, or food processor to blend all the ingredients together until smooth. Take about 1 cup of soup out of the pot and slowly drizzle the heavy cream into the cup of soup while stirring. This tempers the heavy cream so it doesn’t curdle. Slowly add the cream/soup blend into the pot of soup, stirring constantly until incorporated. Serve with your favorite roasted vegetable. I roasted broccoli and served as a side.